Catholic News Service presents a series of columns in the wake of the recent national elections from leading archbishops on key issues facing the church and the new Trump administration. Religious freedom issues have certainly been in the news in the U.S. over the past several years — from the Little Sisters of the Poor to the freedom of organizations to hire people who aim to serve the mission of the organization. If the Little Sisters — who run nursing homes for the elderly poor — do not comply with the HHS mandate, the federal government could impose financial penalties against them in the millions of dollars. The Little Sisters have admirably served others here in the U.S. since 1868. They should be able to continue their good work as they always have without facing the prospect of draconian fines. In another example, the federal government seeks to restrict the hiring practices of faith-based organizations that partner with the government to provide needed services, especially to our military service members around the globe. Chaplains in the military contract with providers of religious goods — such as eucharistic supplies like chalices — in order to allow the men and women who serve our country to continue to practice their faith, including when they are in harm’s way. President Barack Obama’s Executive Order 13672 would restrict faith-based organizations from being able to hire people who agree with the mission of the organization if they have a contract with the federal government. Faith-based organizations should not be excluded from working with the government to provide much-needed services. President-elect Donald Trump can alleviate the current financial and regulatory burden that weighs heavily on people of faith. First, the president-elect can — and should — rescind executive orders that effectively exclude faith-based organizations from partnering with the federal government, such as Executive Order 13672. Second, the president-elect should direct the head of HHS to place an immediate moratorium on the HHS mandate. Then the next administration should rescind the HHS mandate. Contraceptives are not preventive “health care,” and indeed are associated with adverse health outcomes. Rescinding the HHS mandate would ensure that people of faith like the Little Sisters can, without threat of massive fines, offer health insurance that comports with their religious values. Doctors and hospitals should be free to use their best medical judgment to treat patients who experience gender dysphoria. Health care providers should not be told by the federal government that they must participate in procedures that have the effect of mutilating a patient’s otherwise healthy reproductive organs. Hospitals should not lose Medicare or Medicaid funding over this issue. Teachers and school administrators at the local level should be free to use their best judgment — working with parents and counselors — of how to deal with extremely sensitive issues involving young children. Further, schools with religious exemptions to Title IX should not be placed on a “shame list” run by the U.S. Department of Education simply for claiming an exemption — a right that stems from the Constitution. Fourth, the president-elect should direct the U.S. Department of Housing and Urban Development to stop enforcing its “gender identity” mandate on homeless shelters, such as many operated by faith-based providers like Catholic Charities. HUD’s mandate would force women in federally funded homeless shelters to share shower facilities, restrooms and sleeping areas with biological men who “identify” as women. Many times, victims of domestic violence seek a safe haven in shelters. Women and girls should not have to give up their privacy or safety when they go to a shelter. President-elect Trump has the opportunity to ensure that people of all faiths can continue to do their good work in serving their communities without having to violate their consciences or face crippling fines or onerous lawsuits. Our hope is that the next administration will ensure that Americans remain free to serve. 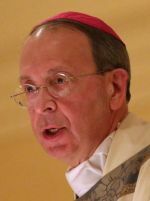 Archbishop William E. Lori is Archbishop of Baltimore and chairman of the U.S. Conference of Catholic Bishops’ Ad Hoc Committee for Religious Liberty.